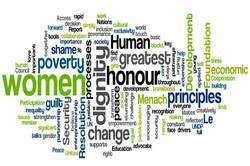 We believe gender inequality and exclusivity limit pathways to peace and hinders human and economic development. So we work for the equal participation of women in decision making at all levels of civil society and governance and support UN resolutions 1325 and 2122 involving women in peace and security. We believe in the power of imagination, communication, education and partnership to help rebuild trust and generate cultural change. Join us! United Nations in New York.